UNC Charlotte’s Department of Criminal Justice and Criminology conducted a study of over 400 incarcerated burglars to uncover what motivates them and if there were any specific deterrents that they encountered. One of the most commonly mentioned deterrents was a lack of hiding spots available on well-lit properties. After reading this study, I’ve been looking for a decent flood light to light up my back patio and keep potential burglars from sneaking around my back porch. When I googled “best security lights,” I was immediately bombarded with dozens of ads and options to buy. From flood lights and motion sensors to solar, LED, and incandescent lights, I didn’t know the differences between each product. The whole experience left me feeling more in the dark than when I started. I decided to dig in and find out what all the lighting jargon means and from there shed some light on different types of security lighting. Click here to learn more about the different types of security lighting. Dimensions 13.2 x 10.2 x 6.4 in. 10 x 9 x 8 in. 3 x 8 x 6.1 in. 13.2 x 10.2 x 6.4 in. 10 x 9 x 8 in. 3 x 8 x 6.1 in. We chose the RAB Super Stealth motion sensor light as the best option for a large outdoor area because of its long range, versatility, and overall power. The motion sensor reaches out 60 feet from the sensor in a 180 degree pattern, which easily beats any competitor. The RAB Super Stealth works with both high-powered incandescent and LED bulbs, depending on your preference. With a watt capacity up to 1000 watts, the RAB projects powerful beams deep into the darkness. 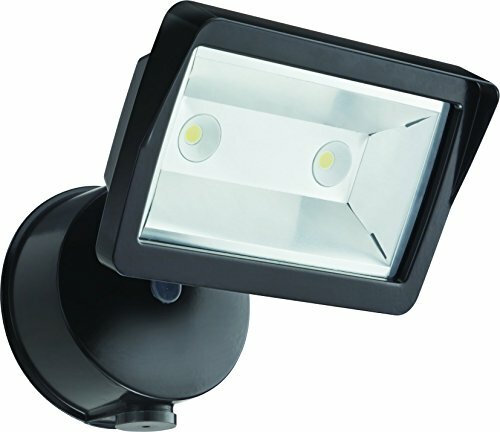 We like the motion-activated dual head LED from MAXSA Innovations for lighting small and medium outdoor areas because it produces a lot of light on very little power. It only takes 0.5 watts to power these LED bulbs. The motion range extends an impressive 40 feet from the sensor. Though it’s not as far as the RAB, it’s perfect for mid-sized areas like a patio or driveway. 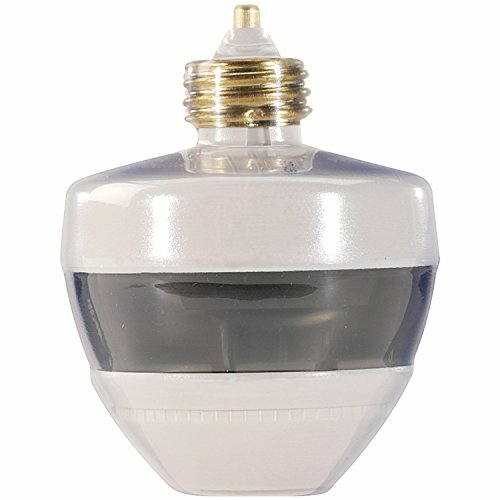 We chose the First Alert PIR725 for our best close-quarters option because it is sleek and inconspicuous and allows you to add security to a porchlight or hallway without making major changes.This motion sensor converts any light socket into a security light without the bulky light fixture. It works with standard LED, incandescent, and fluorescent bulbs and has a 360 degree motion range of 12 feet. It’s perfect for close-quarter security lighting. Dimensions 5.9 x 7.2 x 5.5 in. 6.4 x 7.2 x 5.9 in. 6.4 x 4.4 x 4.4 in. 5.9 x 7.2 x 5.5 in. 6.4 x 7.2 x 5.9 in. 6.4 x 4.4 x 4.4 in. Although the FTR1740L has lower lumens and uses a higher wattage, we rank it as number one simply because it has two directional bulbs instead of one fixed bulb. The ability to cover more area increases its security value over the FSL2030LW. The FSL2030LW is a better light in all the spec categories, but since it’s a fixed position light and only has one bulb, we’ve knocked it down to #2 on our list. If you prefer a brighter, more energy-efficient light, this is the one you want, though you’ll sacrifice some area coverage. 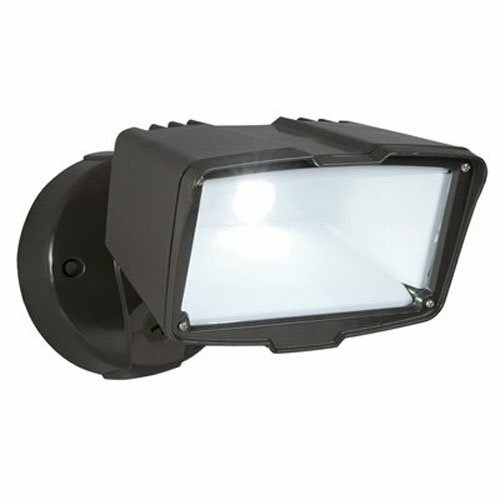 The M4 Security LED is similar to the FSL2030LW—a fixed floodlight that builds value with energy efficiency. It’s the most energy efficient of our top 3, though at 1351 lumens, it won’t emit as much light as our top 2. Dimensions 8.7 x 6 x 5.8 in. 19.4 x 12.2 x 5.1 in. 12.2 x 8 x 6.5 in. 8.7 x 6 x 5.8 in. 19.4 x 12.2 x 5.1 in. 12.2 x 8 x 6.5 in. 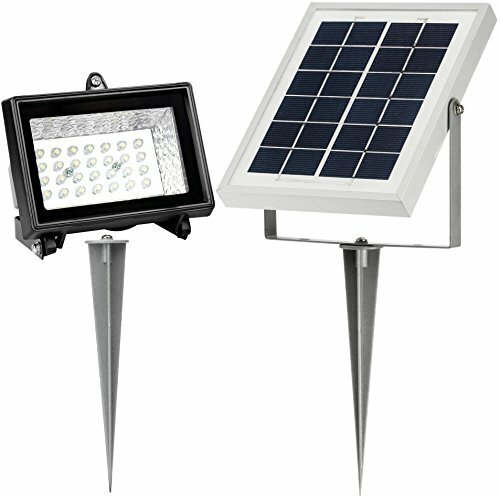 A solar light with a motion sensor that can detect between 16 and 32 feet and has 700 lumens is pretty impressive, and it makes the 80 LED our #1 solar flood light pick. The Micro Solar 120 LED doesn’t come equipped with motion sensors like the 80 LED, but it’s still an impressive solar flood light. We like that it can be wall mounted or ground mounted with stakes, and, as part of the “Dusk to Dawn” line from MicroSolar, it has an 8- to 12-hour continuous working time. It’s very light and can be moved and remounted easily if need be. 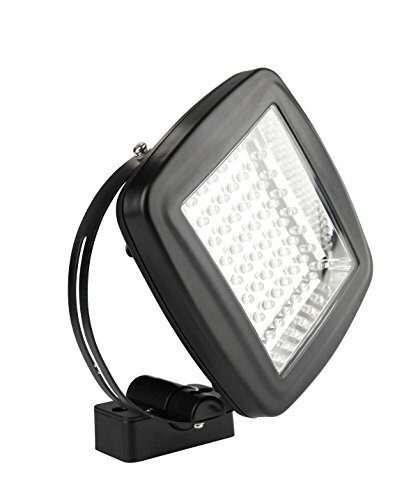 The Micro Solar 64 LED is the baby brother to the 120 LED above. It’s light, easily mountable, and runs for 8 to 12 hours per day on solar energy. The difference is that it has roughly half the lumens, but it’s also almost half the price. 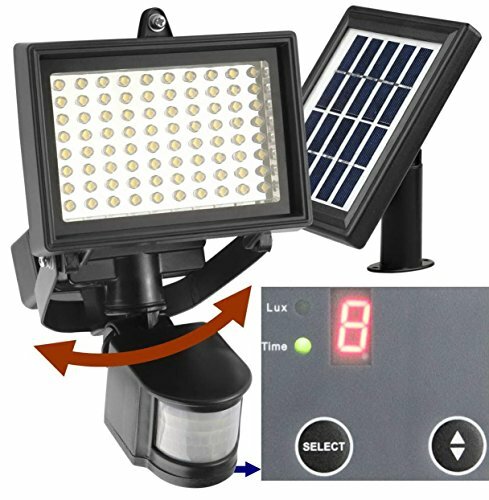 This is a nice, affordable option for solar security lighting. What kind of security lights are out there? 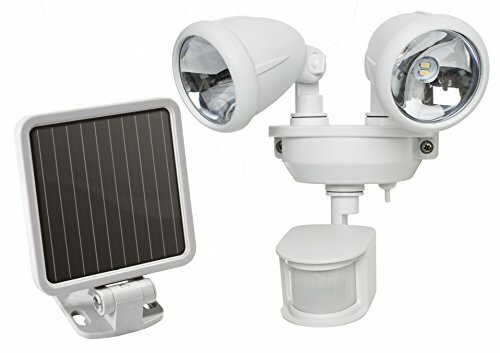 There are countless different types of security lights, configurations, and add-ons out there that allow you to customize your lighting pretty much any way you want it, but we’ll focus on three of the most common: motion sensor lights, LED flood lights, and solar flood lights. Any light is better than no light at all, but there are a few important factors to consider when you’re shopping around for security lighting. How far from the fixture will it illuminate your property? Should you go with LED or incandescent lighting, and what type of light works best for each area? For years, light bulb technology hadn’t moved much beyond the genius of Thomas Edison—a light bulb was a light bulb. It wasn’t until 2002 that the first residential LED bulb became available to consumers, but at a significantly higher price. Nowadays, LED pricing has dropped considerably to become a viable replacement for outdated lighting technology. But what exactly is the difference between LED and incandescent? LED lights cost three to five times more money up front—which is why some people avoid them—but they are by far more energy efficient, which saves you money long term on your electric bill and replacement bulbs. What really makes LEDs stand out is their lifespan. LED lights can last between 20,000 and 50,000 hours, almost 5 times longer than any other type of light bulb. One knock on LED lighting, however, is that it emits a colder, blue-hued light. This really comes down to personal preference. You can see integral-led.com’s break down of warm light vs cool light. Incandescent- Spoiler alert! It takes energy to light up a light bulb. But did you know that with an incandescent bulb, 90 percent of that energy is converted into heat, not light? Incandescent bulbs are cheaper up front but need more energy to emit light and are incredibly inefficient. You’ll change an incandescent bulb 20 times before you’ll need to replace an LED bulb. You’ll spend almost three times as much replacing incandescent light bulbs in the long run. And that’s assuming LED lights don’t become more affordable. We recommend switching to LED lighting wherever you can, both for indoor lighting and outdoor security lights. Both watts and lumens have been used to measure the amount of light a bulb emits, but it isn’t exactly correct. Watts measure the amount of power needed to illuminate the bulb, while lumens measure the actual light produced by the bulb. To put it in perspective, a 60 watt incandescent bulb produces about 800 lumens. Incandescent bulbs use far more energy, meaning they require more wattage to produce the same amount of light as an LED bulb. This is why light output—or how bright a light bulb is—is measured in lumens instead of watts. Keep in mind, the more watts a bulb uses, the higher your energy bill will be. 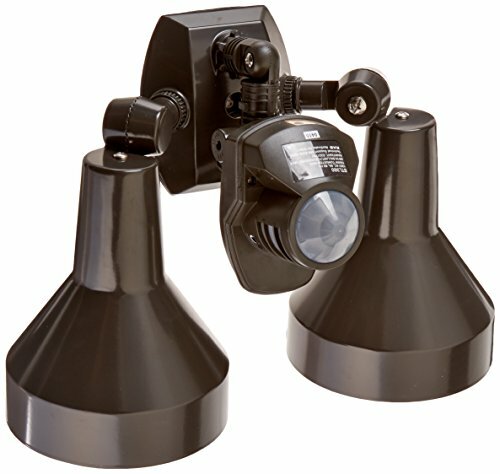 The “range” of a security light refers to two separate functions for your security light. Range of illumination—how far your security light actually casts light into the darkness—depends on the bulb’s lumens, and motion sensor range is how far away a motion sensor will register movement in the darkness. Not all security lights need to illuminate an entire yard. Some only need to light up your porch. The best security light changes depending on where you plan to install it. Check your bulb. LED, incandescent, and compact fluorescent bulbs will each be rated by the number of lumens they produce. More lumens equal more light. 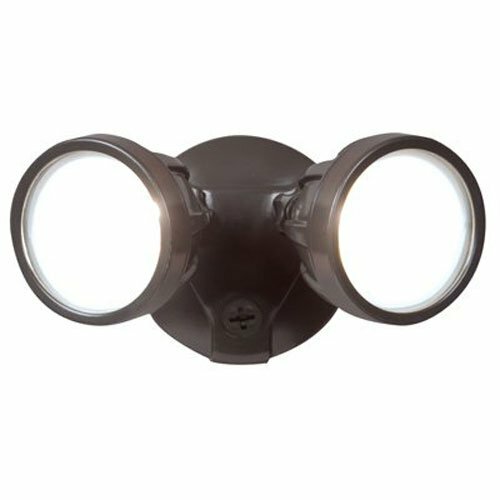 If you want widespread light for your backyard or driveway, you need something with high lumens (700+) that can project light further from your fixture. However, if you simply need to light up a porch, you can use an adapter like our #3 option (anchor) for motion sensor lights. Consider your intended location before you choose your security light. Sometimes referred to as detection range, the ideal motion sensor range for an open area security light is at least 40 feet. Take some time to consider what type of security lights will best suit your home. 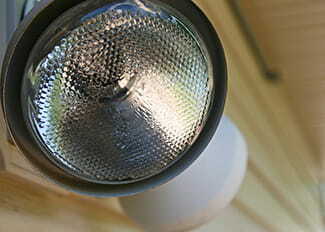 Security lights are quick and easy to install and are proven to be a highly effective crime deterrent. Keep your property well lit and minimize potential hiding spots for burglars. Chances are, if they trigger a security light, they’ll retreat back into the darkness and look for another target.